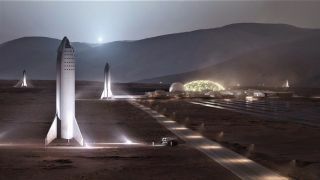 An artist's illustration showing SpaceX BFR spaceships standing at the Red Planet outpost "Mars Base Alpha." Musk's company SpaceX is building a huge, reusable rocket-spaceship duo called the BFR to help our species explore and settle Earth's moon, Mars and other worlds throughout the solar system. Musk's timelines are famously aggressive, and a lot would have to go right to hit that 2028 target. After all, the BFR (which stands for "Big Falcon Rocket") is still in the development phase. The first orbital flights of the 100-passenger spaceship and its giant booster probably won't come until 2020 or 2021 at the earliest, Musk said last week during an event at SpaceX headquarters in Hawthorne, California. Neither Musk nor Maezawa revealed how much the latter is paying for the flight (though Maezawa did confirm that the artists will fly for free — he bought all the seats). But Musk said Maezawa has already made a substantial down payment and that his purchase is a big help in defraying the BFR's development costs. Those expenses will probably run around $5 billion when all is said and done, Musk said Friday. "This has done a lot to restore my faith in humanity — that somebody's willing to do this — to take their money and help fund this new program that's risky, might not succeed [and] is dangerous," Musk said. "He is ultimately helping to pay for the average citizen to be able to travel to other planets. It's a great thing."